„If you wanna start, start big!“ is what Groppioni Paolo (GrP) must have told me in 2008. 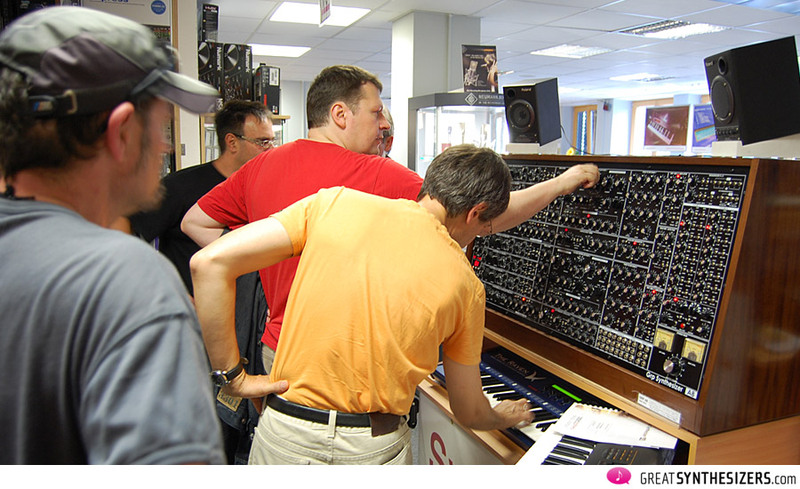 We were sitting in front of a huge proxy of a synthesizer panel. 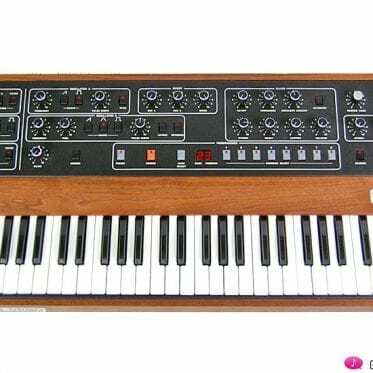 In fact, the A8 – with 127 x 67 cm – is one of the largest synthesizers ever produced. Beside its monstruous size, it’s its concept that makes the GRP A8 awe-inspiring. More than that – I believe the GRP A8 has become a milestone in synthesizer history. 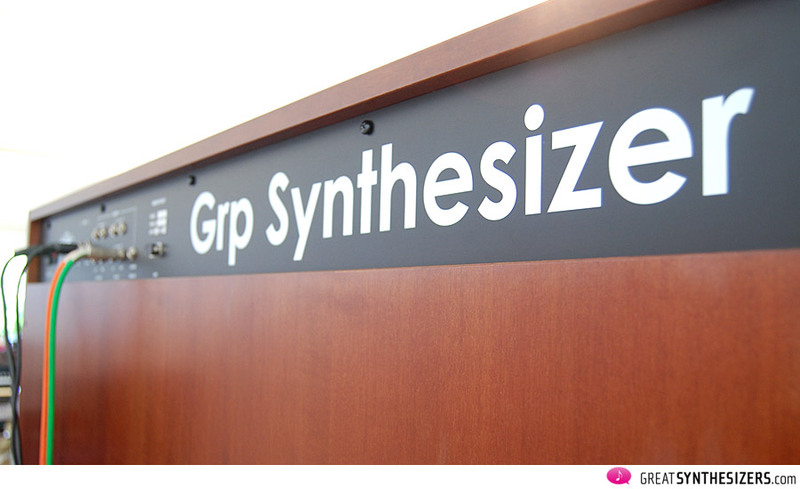 While most modern analog synthesizers follow the concept of classic synthesizers, GRP has gone its own way. Fabulous sound is the basis, of course, but on top of this the GRP concept is tremendously flexible. There’s a fantastic intuitive user surface (with knobs instead of patches, so you’re faster), MIDI and (!) CV/gate, delightful performance features including the synchronization of all rhythm-based components (LFOs, S/H, auto-pan, sequencer …), and well … a wonderful – absolutely unique! – step-sequencer. Impressive, don’t you think? 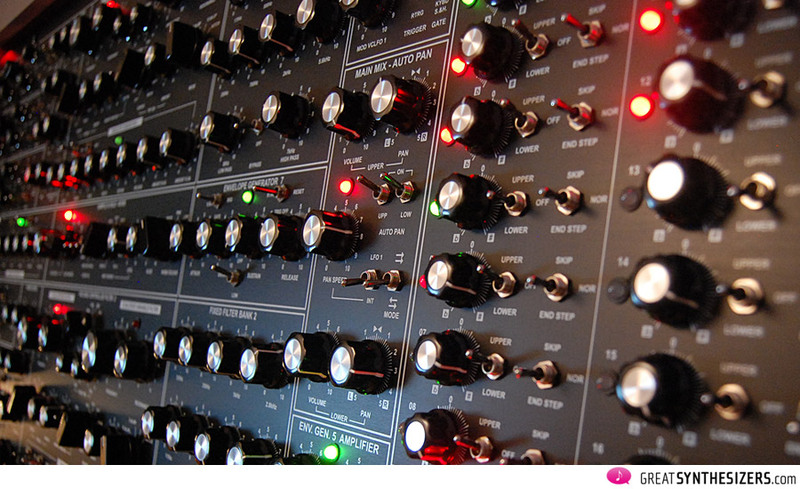 Although: it’s not about counting oscillators and making you believe that tons of modules guarantee musical flexibility. Of course, the GRP A8 does all that! But the heart of this great musical instrument is its state of the art concept. 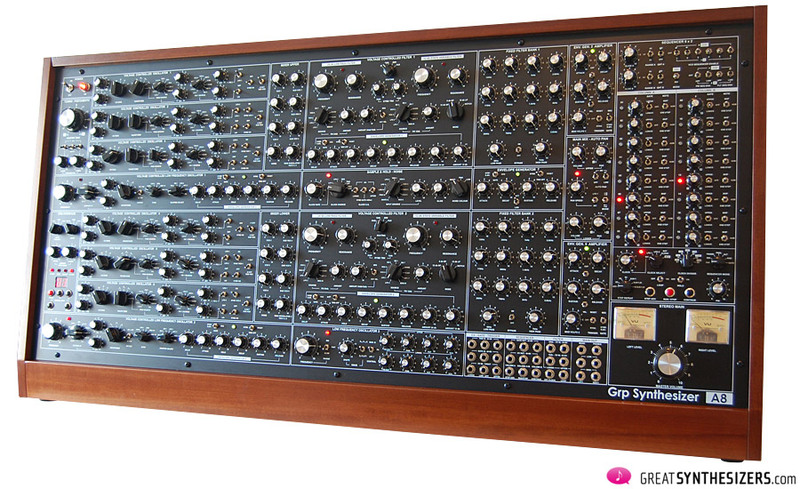 Is it another Moog 55 clone you’re looking for? If so, then stop reading, you’re on the wrong boat. The GRP A8 is not modular. And thank God for that! All audio- and modulation-routings are pre-patched. No cables hanging around, no spaghetti …! The A8 is a futuristic analog studio system, creating a near-to-perfect performance environment. Using multi-selection knobs instead of patchcords guarantees a speedy workflow without loosing yourself in a jungle of cables. 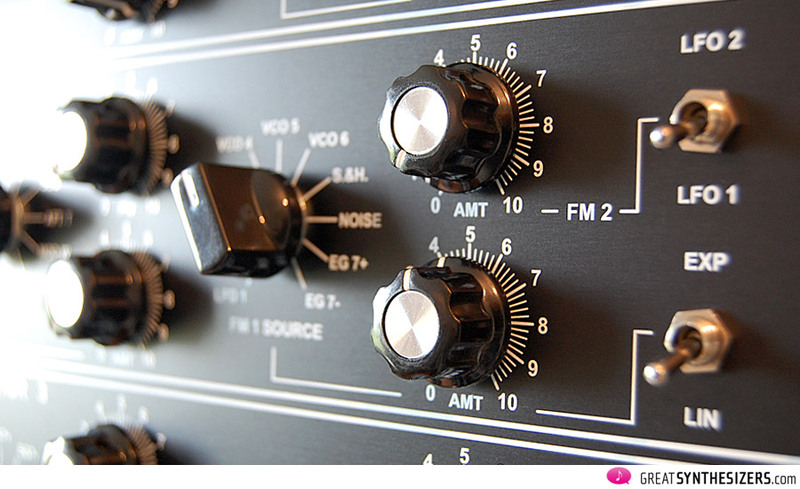 Generally, the A8 has 11-way switches for modulation purposes. 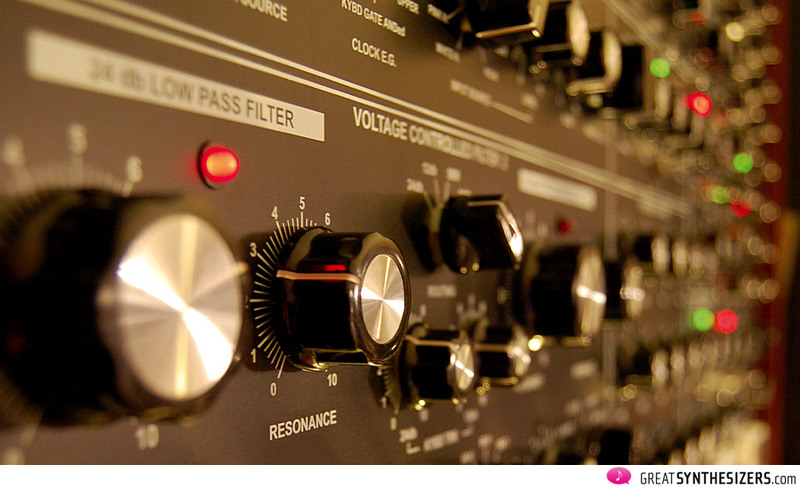 VCO 1, for example, uses LFO 1, LFO 2, VCO 2, VCO 3, VCO 4, VCO 5, VCO 6, S&H, NOISE, EG 7+ or EG 7- as a source for FM. Just select the source you wish and off you go! While this philosophy of a modern patchwork instrument leaves you with, let’s say, 90% of a regular modular synthesizer’s possibilities, it compensates with an sinfully comfortable user interface. Imagine you with a heavy a 3-VCO (plus, let’s say, 2 sub-oscillators) Moog-like solo sound. Great, precious, analog! Two filters (in serial or parallel), a wide-range LFO (up to 2,2 kHz), three envelopes, a fixed filter bank … enough material to play around with for hours (and days, weeks, …). This is the UPPER section. Now press the start button and let the step sequencer take over control of the (identical) LOWER synthesizer. Jiggling a few knobs gets you a fantastic ring-modulation sound with some shimmering OSC-to-VCF FM. 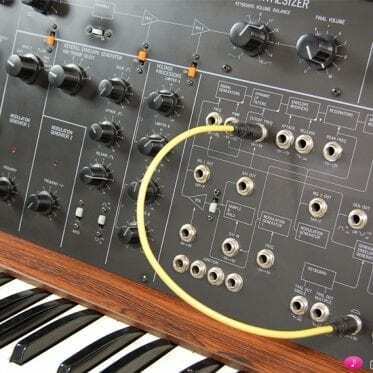 The sequencer-controlled ring-modulation sound follows every single note of the UPPER synthesizer Moog line. Turn on the auto-pan module (in bidirectional mode) and listen to the two sounds going left to right and vis versa. Switch the UPPER filter to velocity control and the LOWER filter to sequencer control. Now turn the LFO 1 modulation of the UPPER VCA to full right and synchronize auto-pan to LFO 1. 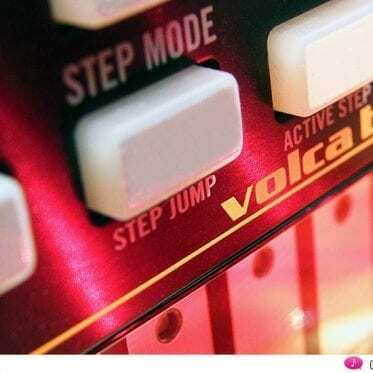 You’ll also want some dynamic control over the LFO speed, so simply turn its FM CV source to velocity – voilà …! Tons of possibilities! So now it’s midnight (and everyone’s asleep) and you’re sitting there completely overwhelmed by the instrument’s potential. You haven’t even used sample & hold yet, and none of the two fixed filter banks … ah yes, and there’s noise, of course … and the additional 7th envelope. While the GRP A8 is a complex analog synthesizer, it’s still very user-friendly! Sure, it takes a couple of days to get familiar with all those functions, but that won’t take forever. Once you’re used to the basic work flow, the musical potential is unbounding. The GRP A8 can be seen as a genuine 6-VCO mono-synthesizer, a flexible two-voice synthesizer with 3 VCOs each, a completely independant sequencer-workstation, a pure MIDI sound-tool, a classic CV/gate controlled machine – or a combination of any of these. 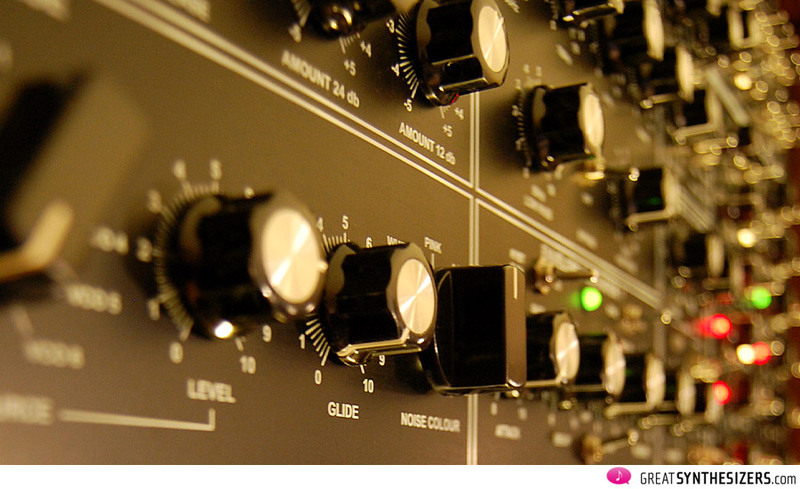 Most of those great vintage synthesizers and modular systems from the 70s and 80s sound extremely beautiful. But they have their limitations. Either getting them MIDIfied is a nightmare or you can’t synchronize their (usually very basic) step-sequencer easily. There is no way to clock the vintage LFO to any other time based module and connecting a velocity sensitive keyboard might mean 30 minutes (and a few extra modules) to get it running … well … back to the Stone Age! 1. Oscillators. 6 VCOs and 6 sub-oscillators are a luxury. 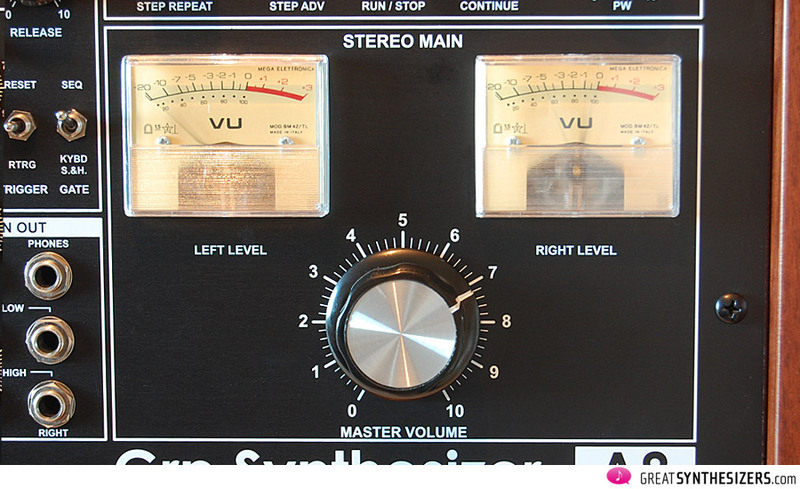 Each VCO has 6 waveforms, going from 64’ to 2’. Individual tuning and fine tuning are both possible, of course. PWM may be done by one of the 11 modulation sources (among these: sequencer, aftertouch and velocity). Frequency modulation is possible in two busses: FM 2 uses the two main LFOs while FM 1 has the 11 modulation sources we mentioned earlier (these with comprehensive cross modulation functions). Oscillator synchronization is possible and the keyboard may be disabled for a “static” oscillator frequency. 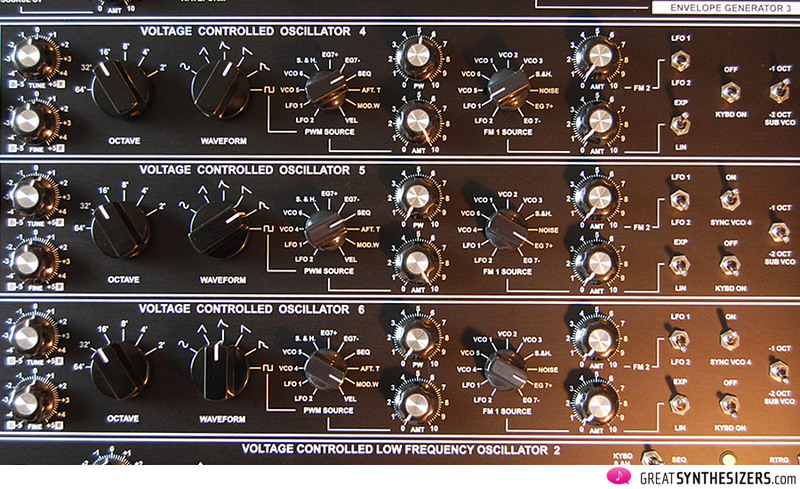 Each VCO has its own sub-oscillator 1 or 2 octaves below initial frequency. 2. Filters. A total of four filters. Each synthesizer unit offers a 24dB lowpass filter (Moog style) and a 12dB multimode filter (Oberheim style) with HP, BP, LP and notch. The filters can be used independently (the 24dB anlone or the 12dB filter), in serial or in parallel. FM is possible via keyboard tracking, sequencer, velocity and an individual FM bus (again, with 11 sources to choose from). Each filter compartment has its own 6-stage envelope (a regular ADSR with delay and hold function). Keep in mind the A8 is bitimbral, meaning true stereo. Independent sounds (each with panorama control) – with, let’s say, slightly different filter modulation – guarantee impressive musical textures. The filters are marvellous. I often stick with just one 24dB Moog filter for a meaty and very powerful sound. High filter resonance settings enable unique timbres. This is classic analog pure. On the 12dB side, I’m especially fond of the notch filter. This is the sound of my Oberheim 4-voice in unison mode. Rare. 3. VC LFOs. The two main LFOs are voltage controlled. Their frequency ranges from „very slow“ (to be honest, it could be even slower) to 2,2 kHz. We’re not talking about static LFOs, since speed modulation is possible by – you’ve already guessed – 11 sources: sequencer, key(board), the “other” LFO, EG (for those Yamaha CS-80 sound effects), modulation wheel, etc. Each LFO comes with its own envelope generator. This controls speed and/or modulation amount: SHAPING, GRP calls it. The EGs are 6-stage (with delay and hold function). There are 5 waveforms to choose from and LFO synchronization is possible – to GATE (any incoming key information, via MIDI or analog gate), to the “other” LFO, to sequencer or MIDI. Superb. 4. Synchronization. This is what I miss most on vintage analog synthesizers: the possibility to synchronize all rhythm-based (time-based) components. But now we have the GRP A8. LFOs, S/H, auto-pan, envelopes, sequencer… it’s up to you whether you use them individually or synchronized. It’s even more than that: sample & hold, for example, may be used as a clock source, triggering the envelopes. 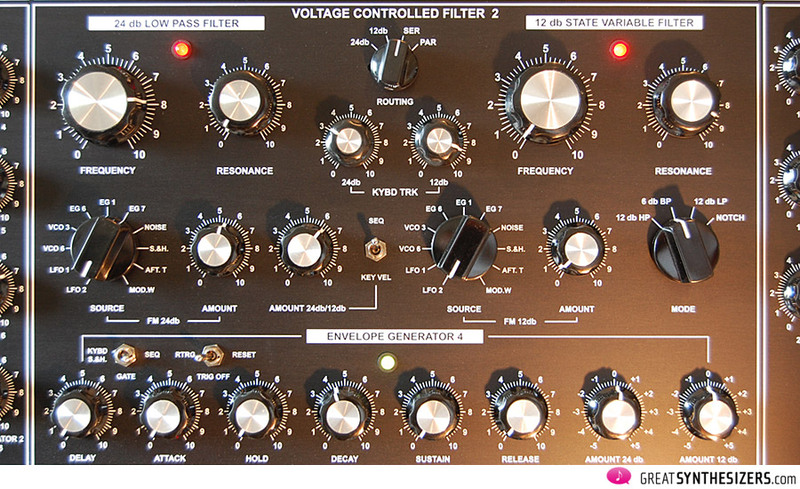 While sample & hold produces stunning sound effects (filter frequency modulation, e.g. ), you still don’t want to leave the sequencer unused. So simply set the sequencer clock source to S/H … and there you go. Of course there’s MIDI clock, too … plus the possibility of different clock-divider settings. 5. MIDI. This gets special mention. MIDI plays a very important role in the A8 concept. It provides for dynamic control, for example. We’re familar with velocity-to-filter. But here velocity can also control amplification, oscillator pulse width, LFO speed (!) and LFO shaping (modulation amount). Aftertouch and modulation wheel destinations are VCF (all four filter frequencies), PWM, LFO 1/2 speed, LFO 1/2 shaping, LFO 3 amount. Each of the A8’s two synthesizer sections has its individual MIDI channel, each has its own pitch bend range and its own portamento time. MIDI clock controls – if desired – LFO 1/2, S/H, auto-pan (via LFO 1) and the sequencer. 6. Sequencer. Well, this is tricky. The A8 sequencer is far more flexible than any analog step-sequencer I’ve ever played. To start with, it has two CV- and two gate-rows. Each gate step may be switched individually to the UPPER or LOWER synthesizer (or to pause). The simplest way to create true stereo patterns is to set the UPPER synthesizer output to LEFT, the LOWER to RIGHT and trigger them alternatively step by step. The sequencer may be addressed to the 6 oscillators (of course), to the 4 filters and to PWM (upper and lower). Each row (A and B) has a quantizer, if you need tailor-made semi-tones, and each row has glide (as in the days of the good old Korg SQ-10). STEP REPEAT determines how often each step is played: “x2” doubles each note, there’s also “x3”, “x4” and there are some tricky mathematical formulas: N, N+1 means “note, note +1 step”. There’s also N, N+1, N and N,N, N+1, N. This may sound stupid on paper, but the rhythmical results are dazzling. It’s possible to programme unique patterns miles away from any sequence you’ve ever heard. I like GATE a lot. 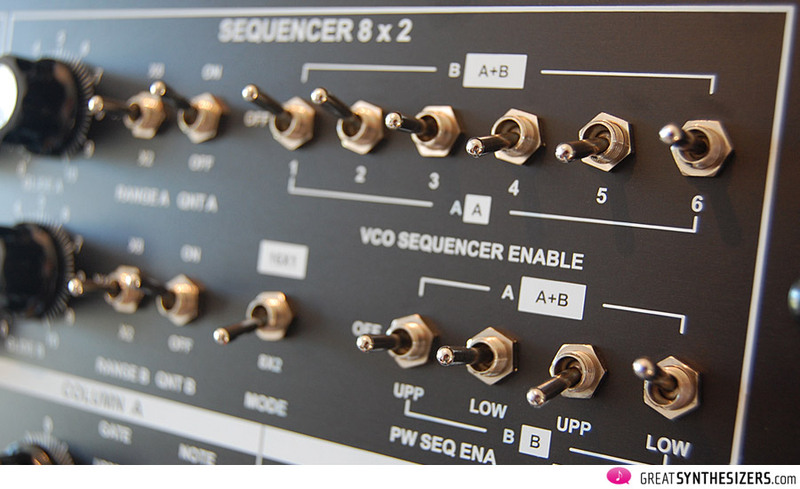 You hook up an analog or digital device (MIDI or CV/gate), select sequencer mode GATE. And that’s it: the sequencer goes one step ahead with every note played. Connect any workstation and watch the A8 sequencer playing in time once you’ve started the workstation’s song. 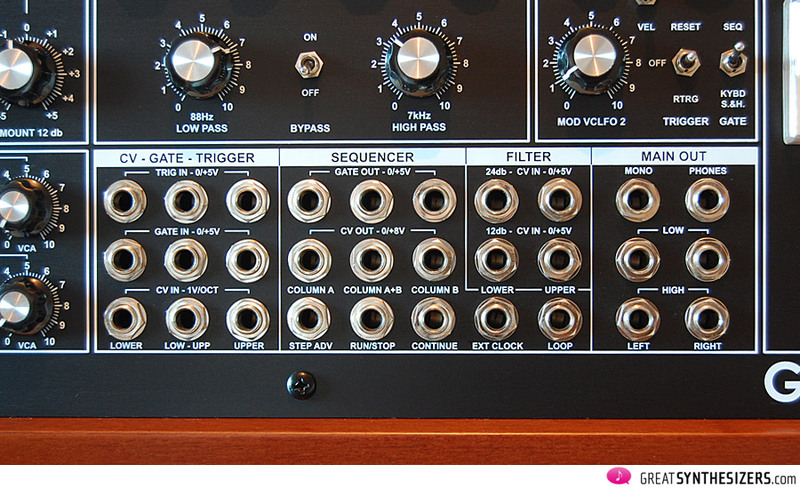 Or use the great Elka Synthex sequencer as a master clock. It works! Or simply “control” the A8 sequencer in real time … play any keyboard solo and the A8 sequencer operates parallel. Ah yes, and there’s PW (pulsewidth). Turning the knob far right extends the length of the note, turning far left shortens it. Simple and useful. Last, but not least there’s a whole bunch of in- and outputs. 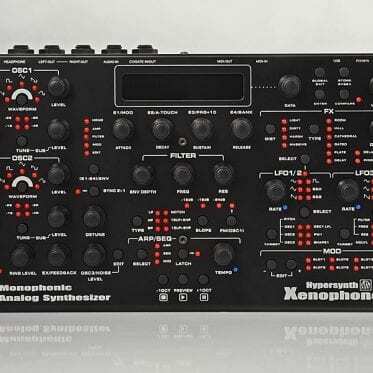 You can synchronize the sequencer with other analog gear and – this is wonderful – control external monophonic synthesizers (1v/oct) with the GRP sequencer. Well, there is one limitation … but I’ll let you know about that later. The GRP A8 is the incarnation of analog sound. It’s a Minimoog, a Prophet-5 (solo voice), an Oberheim … and an ARP-2600. That’s all in there. Deep bass-lines, great brass-sounds, massive lead-lines, exotic FM-sounds, experimental stuff … what more can you wish for? Just check the attached soundfiles carefully. Remember, this is MP3 quality … imagine how stunning the original sound material is! Great sound quality is one aspect. Wonderful performance another. Together, they make one of the few truely electronic musical instruments on this planet. The A8. So this is the “perfect” analog synthesizer? The GRP A8 is very good. It is fantastic. But it is not perfect. 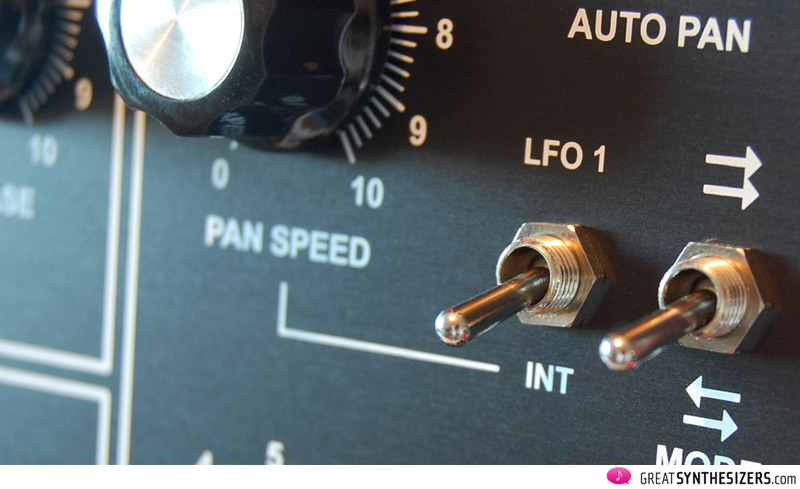 First, velocity and aftertouch can not be used for oscillator frequency modulation. There are 11 sources for FM, sure. E.g. : each VCO is allowed to cross-modulate with the remaining 5 (!) oszillators. This, in my opinion, is a little exaggerated. A selection of 3 VCOs plus VEL and AFT would have been the better choice. Third, there is no way to control the input level of the 24dB and 12dB filter indepentently. There is no real need for this in single filter mode (either 24dB or 12dB only). But in serial and parallel it can in effect be a weakness. Fourth, the sequencer output (row A and row B CV/gate out) does not merge with incoming MIDI data. Straight talk: key information via MIDI will not be carried to the sequencer (analog) output. Controlling other 1v/oct synthesizers, the GRP sequencer sends plain cv/gate data, but ignores any transpose information you might want to contribute via MIDI. This data merge functions of course inside the GRP, so playing the A8 alone results in this happening automatically. August 2011. I’ve just moved into my new apartment. The projected studio is a room full of keyboard cases and boxes. No problem, chaos is part of everyone’s life. It takes months to set up a complete studio. But I don’t want to be without synthesizers all that time. 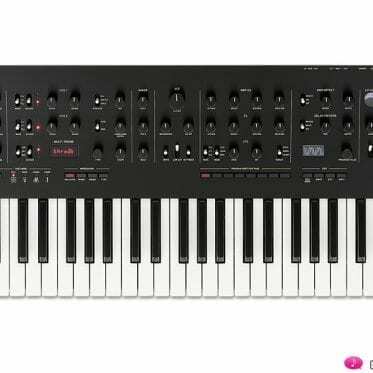 So, which is the favourite synthesizer and what is the smallest studio I could be happy with? In a split second I’ve decided for the GRP A8 and Roland JD-800. The A8 covers all (monophonic) analog sound material, the JD-800 adds some polyphonic warmth … and acts as a masterkeyboard, by the way. After a few hours of making music (producing some of the attached demos and feeling very happy), I stop playing. Surrounded by all those keyboard cases slouching on the floor, housing those great vintage instruments I’ve fallen in love with during the last two decades, I start to have my doubts. Are all these things really necessary? There’s the Minimoog, ARP Odyssey, Sequential Pro-One, Synton Syrinx, Roland System-100, Korg MS-20 and 800DV, Roland SH-5 and SH-7, Yamaha CS-30 and CS-40M, PPG 1002, Oberheim OB-1 and even the ARP-2600. Great instruments, each of them a class in itself. But do I need them for making music? To be honest, the GRP A8 alone is enough! I may have to deny this fact right now (what am I doing with all this vintage stuff? 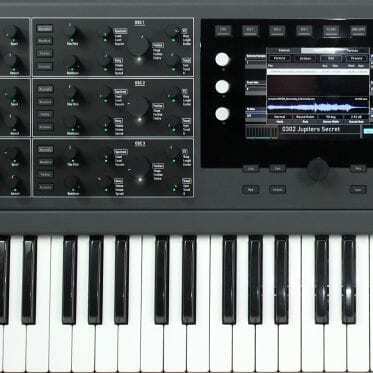 ), but in my heart the decision has been made: from the point of music and creativity, there is no monophonic analog synthesizer necessary alongside the GRP A8. Whether I need Moog-, Oberheim-, Sequential-, ARP-sounds, smashing brass sounds, romantic lead lines, grumbling basses or weird FX-noises: it’s all there. The A8 even produces monophonic FM-sounds with 6 operators (oscillators), in case I happen to be looking for that. Sure, all vintage instruments have their unique character, their own sound. 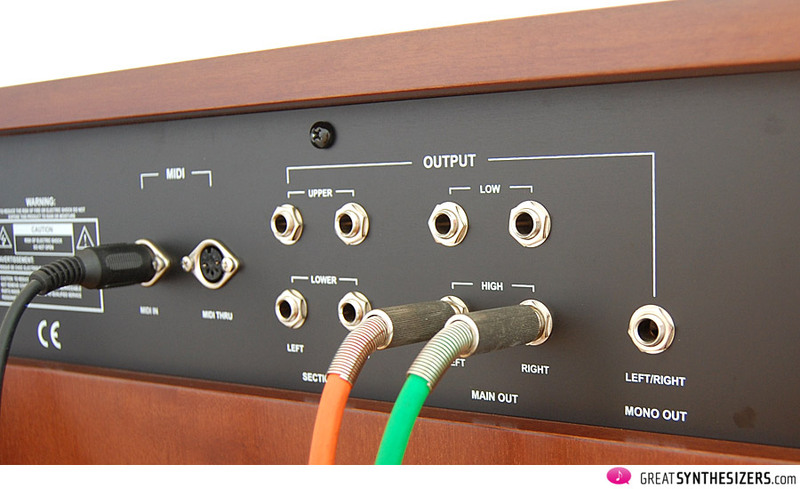 Only an ARP Axxe is an ARP Axxe (I really love its pulse width modulation). 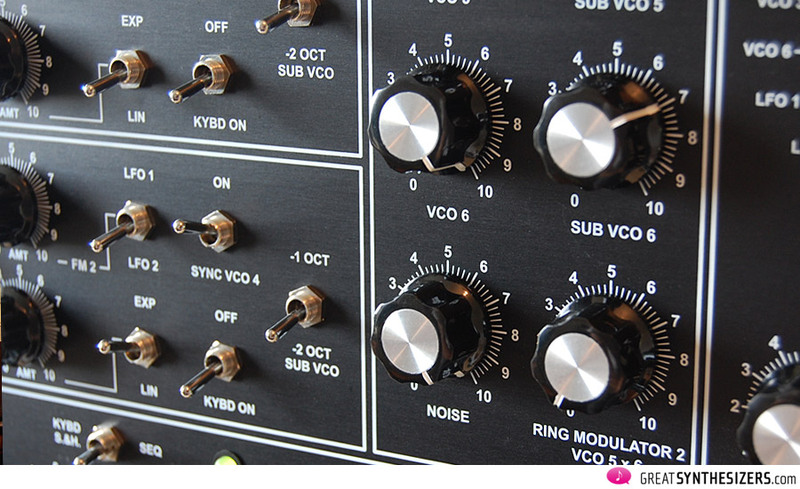 Only a Moog Prodigy is a Moog Prodigy (… colorful sync-sounds!). 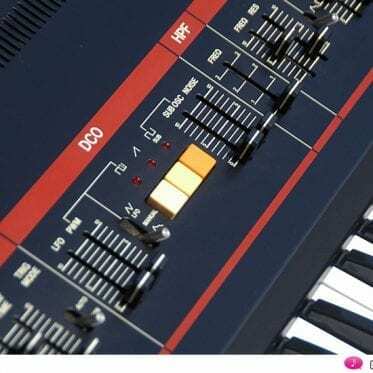 Only a Korg MS-20 is a Korg MS-20 and only a Yamaha CS-30 is a CS-30. Add another 20 of those synthesizers and you end up with a studio completely covered with analog gear. It’s wonderful, no doubt, but it does not equate musical flexibility. It does not mean you’re free of technical problems. What it means, is a lot of work. Time consuming synchronization problems … extra modules to run the analog synthesizers with a modern MIDI setup … failing instruments needing to be repaired … it’s a never ending story. You spend weeks and months in your studio, but where is the music? I’m overly sensitive to analog sounds, which is why I have collected well over 100 instruments. 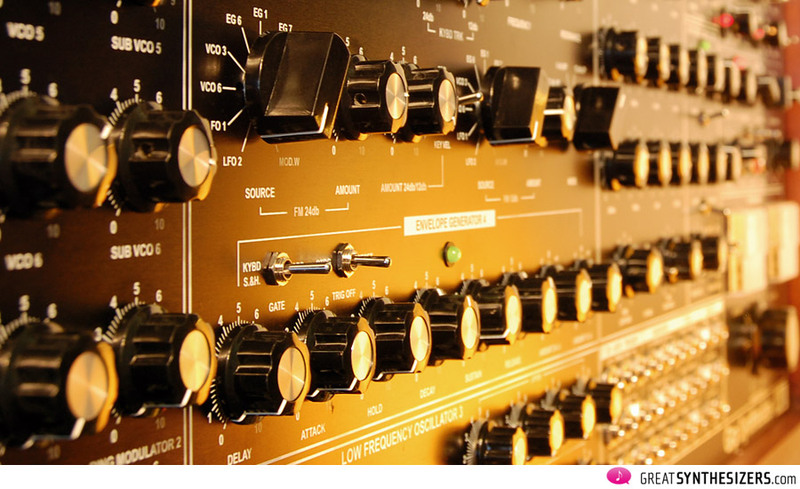 For many years there was just no substitute for the great vintage synthesizers. Those days are gone. Now we have (a very few) excellent modern instruments that create the high quality analog sound of bygone days. 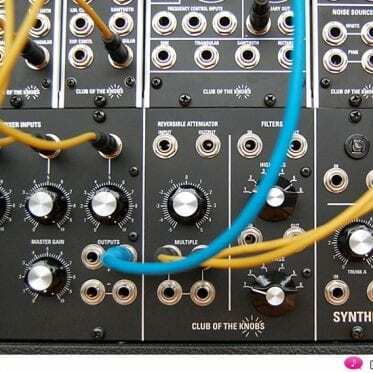 Take a Synthesizers.com or a Club Of The Knobs modular, for example, … if you’re looking for patchable analog synthesizers. 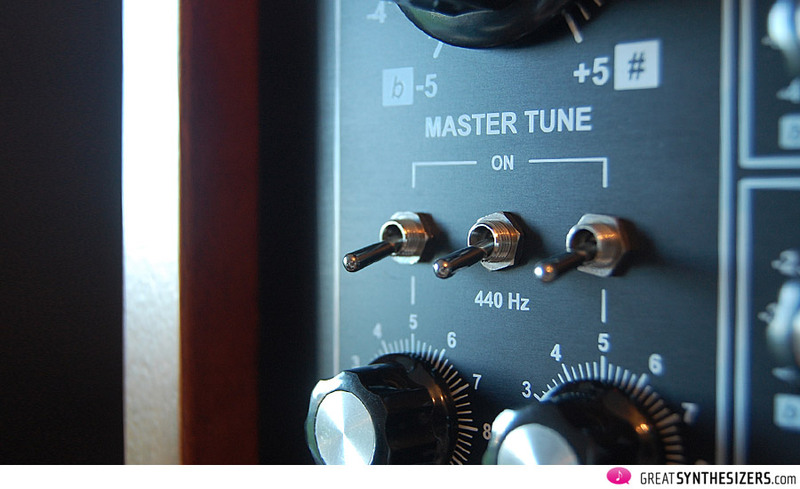 Take a MacBeth M5 … a great machine! 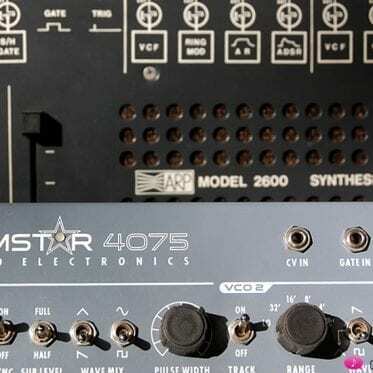 While these synthesizers offer excellent sound quality, their performance standards don’t meet up. I mean musical performance in a modern may. I want MIDI and (!) CV/gate, I want to easily synchronize LFOs and sequencers, I want to have velocity-to-filter control with one click (and not with an extra module, just to get it to run), I want to spend my time making music, not untying patchcords-spaghetti. I want, no, I need the GRP A8. All other analog (monophonic) gear is interesting and useful, but not necessary. Since the 22 A8 instruments are all sold out, GRP possibly (!) plans another production run “somewhen in the future”. Whether the GRP A8 MKII, without those few weaknesses of its predecessor, will become reality or not – we don’t know. But we hope so, of course! This is – more or less – half the A8, including the wonderful sequencer. The GRP A4 costs 4500 Euros (incl. VAT, plus shipping), production starting at the beginning of 2012 and the instruments shipping (ideally) by mid-year. Update Feb. 2016: After 4 years of production (and 180 units that have been sold), the GRP A4 is completely sold out. 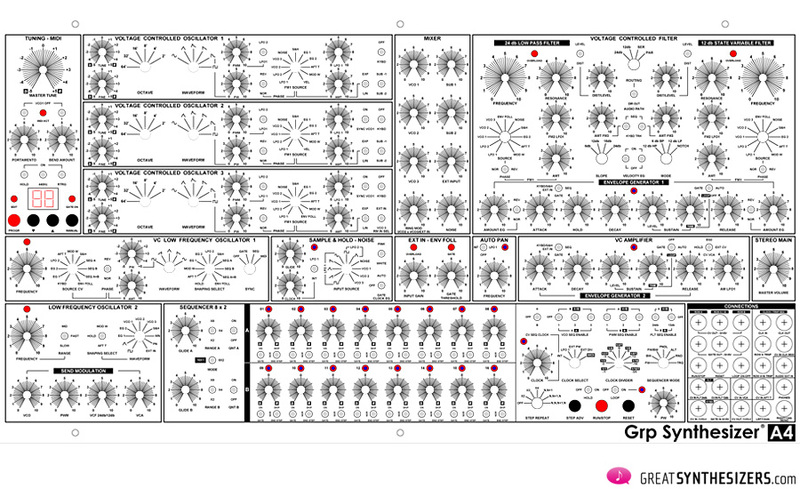 Now, in 2016, GRP focuses on the stand-alone sequencer R24 and other rack-modules. Update Feb. 2017: There’s another GRP A4 batch in process. Contact GRP for ordering. The A4 could be the perfect instrument for many musicians. First, it’s smaller than the A8 (and therefor can be moved and carried around by one person). 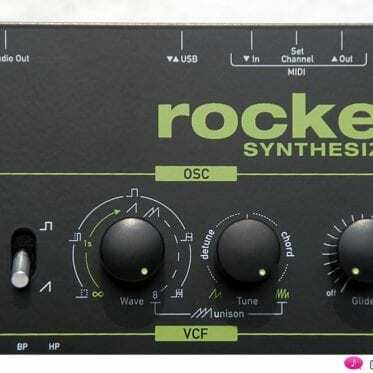 At 80 x 45 x 25 cm, it’s about the size of the Korg PS-3200 (well, a few centimeters smaller). Second, it offers all the sound potential of the A8 (but, mind you, with one synthesizer part instead of two). – AUDIO IN: external audio can be used for signal processing, for ringmodulation, for triggering the envelopes. It also generates a modulation (CV) source useable for VCO 3 FM, frequency modulation on both filters and – excellent – speed control on VC LFO 1. Great. As “raw power” instruments, the GRP A8 and GRP A4 are unsurpassed. If you are a) a synthesizer programmer who loves climbing into nearly every aspect of an analog sound, b) a serious sequencer user with a faible for pattern-based electronic music or c) looking for one of the best synthesizers ever made, then these instruments are for you. Are the pads on ‘Portamento Sequence’ & ‘Dual Vocal’ from the A8? I have contacted GRP to buy an a4 and they are probably making an extra for me. I am happy! especially after I read your article. An A8 or an A4? Anyway … congratulation …! Regards, Theo B.
Paolo just confirmed that my A4 will be ready end of October that’s great because my new cd will be out also end of October. … so it’s the A4, ok. I removed your link, sorry (no personal advertising here). Hope your new CD will be successful. I started with synths back in the 70’s released sins then 16 cd’s and composed 12 film scores 4 american! I was always fond of big modular systems but they where too expensive for me, in 2008 I had an accident that left me paralyzed on my left side so no more piano or guitar for me now I have only one arm to make music so a modular synth is the only way to overcome that I still have a ton of old synths and bought me now a A4 grp to compose my last album ,dante’s inferno, let’s see how I will do with the new A4…. the a4 is more complex then i thought and it needs a serious getting into rge possibilities of the machine so you have to spent some time getting used to it but after a wile it schooled go there are a lot of possibilities modulating all of the modules so spent some time spitting that out. I have some experience with modular systems but the a4 goes deeper into that you definitely need time to learn them all but in the end you will be grateful they put them in. I was very happy I got it but I had to send it back cause there where two switches damaged, by packing or unpacking I don’t know but now it’s back in itali, hope they can fix it soon, I miss it already! it’s a excellent synth that’s a fact! Impressive ! I had never heard of this synth… But you sir describe exactly the problem I had in my studio : You end up being an engineer fixing stuff and overcoming issues instead of being a musician. I sold most of my gear because of this and went partially VST for that reason (shame on me ? 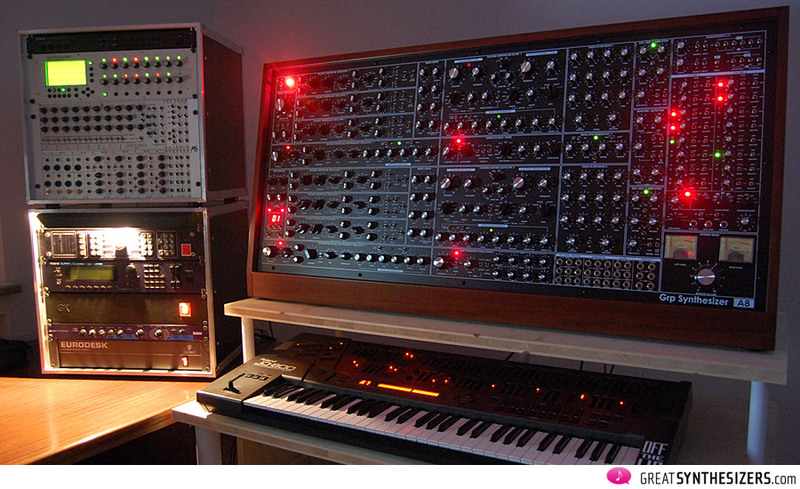 Don’t know… Even J-M Jarre preferes using the Monark vst nowadays vs his hw minimoog).